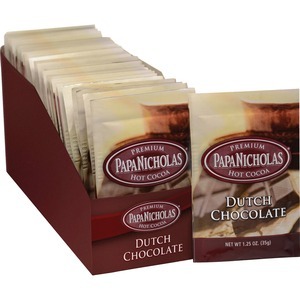 Premium hot cocoa features a rich Dutch chocolate flavor for an indulgent chocolate experience. Hot cocoa was inspired from hot cocoa that was made the old-fashioned way - on the stovetop with natural ingredients like real cocoa, milk and sugar. Each packet contains 1.25 oz. to be mixed with hot water for a nearly instant treat or add hot milk for a richer delight.